Once upon a time, not so long ago, I was in the mood for a milkshake. Well, no, not a milkshake, because they can sometimes feel too heavy. A smoothie!!!! Well, no, not a smoothie, because they can sometimes be too thick and not very smooth at all. I was in the mood for a yummy beverage that was as refreshing as a light breeze, but not too much like a dessert, and I wanted it to be frozen, but I didn't want to add ice (because that always seems to water everything down). So I browsed around my fridge to see what might fit the bill. 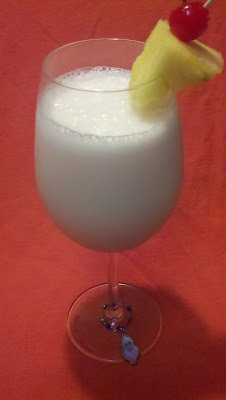 I found a few simple ingredients, whirred everything up with a blender, and suddenly I had found what I was looking for! It was light and refreshing and frozen and delicious and perfect! So the next time you need to cool off on a hot day, give this a try and enjoy the breeze! Place 5 or 6 chunks of fresh pineapple in a blender. Add a 2 or 3 scoops of sherbet. Add equal portions of V8 Splash and milk, just until it almost covers the other ingredients. Blend everything until smooth. You want it to be thin enough to pour. If it's not thin enough, add more milk and V8 Splash. Serve in a fancy glass with fresh pineapple to garnish if you like. And that's all there is to it! Instead of using a regular blender, I used an immersion blender and just mixed everything up in a tall pitcher. One of the things I like most about this drink is that it has such a fresh clean taste. I tried adding a little heavy cream to it and it just made it heavier, not better. You could, however, try adding a little coconut flavored rum..... I'm just sayin!